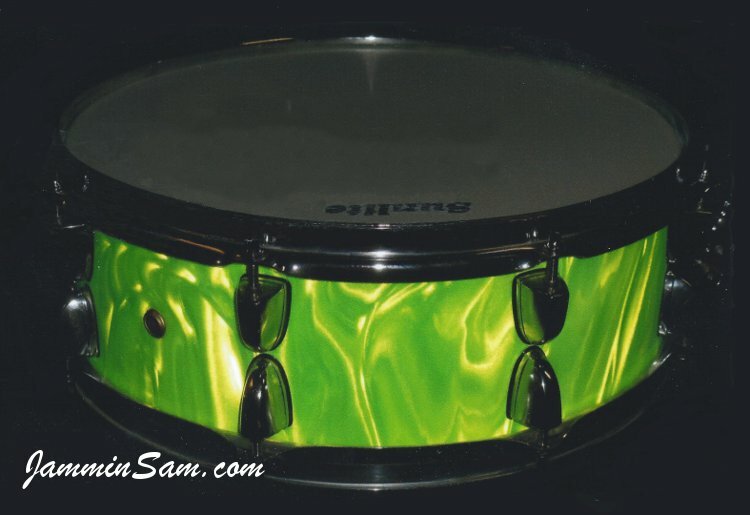 Picture sent in (February 2014) from Shaun Traynor of Indialantic, Florida of his snare drum. Outstanding work Shaun! Sam as per talking to you we tried to send these pictures by computer but had no luck, So I am sending you these photo’s. Hope this is OK for your web guy, These snare’s are presently on sale at Florida Discount Music in Melbourne, Florida on consignment. Shaun has a few other projects he sent pictures of. See them at Blue Satin Flame, White Satin Flame and Neon Orange Satin Flame. Please let us feature your drums with our wrap here.